I love to cook and have lots of cookbooks that I use to guide and inspire me. Each time I buy a new book is a cause for excitement because I know I’m going to discover new things to eat! Most of my cookbooks contain what I call “regular” meals. In other words, they are aimed at ordinary people who have no issues with weight, aren’t looking to eliminate sugar or cut fat, and just want to eat regular food. I don’t usually mind this, but recently I started doing a lot of research into gluten, gluten intolerance, and celiac disease. Through my reading, and because of numerous emails I received from readers of Days to Fitness, I discovered that a lot of people, 6-7 percent of the U.S. population, suffers from issues caused by gluten. Gluten can have an unpleasant impact on how you look and how you feel and because gluten is in almost all grains and grain-based foods, bread and pasta for example, a lot of people cannot eat the same foods as “regular” folk. And this means that many standard recipes are no longer suitable. While you will find some gluten free recipes on the internet, and I’ve published more than 20 gluten free recipes myself, I always like having real recipe books in my kitchen. That way, when I want to get creative with my cooking or am looking for inspiration, I can grab a cup of coffee and leisurely peruse a cookbook to find something new to eat. During my gluten research, I discovered that I too suffer from mild gluten intolerance and, realizing that many of my favorite recipes contain grains, flour, and other high gluten ingredients, I decided to head out and buy some new gluten free cookbooks. At first, I was swamped with choice as there are so many good gluten-free cookbooks around. But, after doing some research, I settled on a few different ones and now want to reveal to you my three favorites. Each one is splendid and loaded with lots of healthy recipes that are, of course, gluten free. I’m happy to recommend any of these books to you but let me tell you a little about each one before you choose which one to buy. This are, in my opinion, the best gluten-free cookbooks. Many people assume that going gluten free means following a monotonous diet. They figure that going gluten free means giving up bread, cakes, pasta, cookies, and all those other yummy but gluten-loaded foods. I thought that too! It seems like two-times New York Times bestselling author Danielle Walker heard our cries and she has written what could be the definitive gluten free book which is loaded with recipes for all the foods you thought you’d never eat again! The theme of the book is celebrations, so it’s definitely the book for you if you like to cook things to match special occasions. In fact, if you look at the index, you’ll quickly see that each chapter refers to a particular holiday or time of year when food is often the centrepiece. For example, you’ll find recipes designed specifically for Christmas, Valentine’s day, Halloween, birthdays, Easter, the Fourth of July, and even Mother’s Day. Each recipe is clear and easy to follow, and most are accompanied by a full-color picture, so you will know exactly what you are making should look like. All the recipes are totally gluten free and are also dairy free too which means that they are suitable for followers of the Paleo diet. I love this book, but I must stress that it isn’t an everyday recipe book. Some of the dishes are a little fussy and grand which is fine when you are cooking for a special occasion but not so good if you want to make a quick and healthy dinner after a hard day at work. Reviews for this book are excellent, and it scores 4.8 out of 5 stars on Amazon.com, with 91% of reviewers awarding it five out of five. At $20.83, it’s the most expensive of my three favorite gluten free recipe books, but it contains over 120 different meals, so it represents very good value for money. If you want your transition from eating gluten all the time to being gluten free to be successful, you are going to have to make some significant changes to what you eat. Gluten is, after all, in almost all processed foods and many of the staples we rely on every single day. Bread, pasta, baked goods, breakfast cereals, and oatmeal are just a few of the foods you must avoid if you go gluten free. This can leave a huge void in your diet. But, with the How Can It Be Gluten Free Cookbook, things suddenly get a lot easier as it contains gluten free versions of everyday foods you probably thought you’d never get to eat again. In this book, you’ll find recipes for gluten free pizza, pasta, lasagne, cakes, bread, pies, cookies, and desserts. You’ll also discover how to use special gluten free flours, so your food tastes great but contains none of that pesky gluten. I’m a big fan of this gluten free flour which I use for a lot of my meals nowadays. This book is more than just a collection of recipes; it also includes sections about gluten itself and how and why it is problematic for some people. You don’t have to read these sections to make great-tasting gluten free food but knowing a little of the science behind gluten intolerance may be useful for some of you. You’ll also find some great cooking tips designed to make your meals even more successful. Each recipe is easy to follow and accompanied by a color or black and white photo and includes handy recipe-specific tips designed to make sure that you have no problems with any of the recipes, ingredients, or cooking methods. The recipes are ideal for everyday use, and while treats are included, the emphasis is on regular meals that are both filling and easy to make. This is another very popular book scoring 4.7 out of 5 stars on Amazon.com. 79% of reviewers award it the full five out of five. At $16.04, this book is good value for money and contains over 100 excellent recipes. It IS more than a cookbook and includes quite a lot of background information on gluten but, personally, I see that as a major benefit and not a drawback. My final favorite gluten free cookbook is an oldie but a goodie. Originally published back in 2009, this book was, in many ways, ahead of its time and was preaching the gluten free word before the rest of the world caught on to the dangers of grains. Back in those days, alternatives to gluten were relatively rare and, as such, the focus of this book is cooking with almond flour – the original gluten free alternative to wheat. Things have moved on a bit since then, and there are now lots of gluten-free flours to choose from – this is one of my favorites – but almond flour is still popular and works well. For me, almond flour can be a bit heavy for some recipes and at has a distinct taste that can be hard to ignore. Some people don’t like it much, and you can often tell when a recipe contains almond flour. Also, almond flour is high in calories, so that’s something else you need to consider if you use it. So, does that mean that this book is a washout? No! It contains some amazing recipes, many of which I’ve tried and come to love. The Gluten Free Almond Flour Cookbook contains 100 recipes for many of your favorite meals including pancakes, cakes, pies, bread, biscuits, and muffins. Each recipe is clearly presented, easy to follow, and some are accompanied by a color photo. I say some because not every recipe is illustrated. Elana also includes interesting information about other gluten-free ingredients such as things like arrowroot, used as a thickener, and agave flakes, used as a sweetener. This book has a strong following, and it’s clearly a good book because it’s been around since 2009. On Amazon.com, it gets a very high 4.5 out of 5 stars, with 74% of reviewers awarding it the full five out of five. At $12.02, this is my cheapest favorite gluten free cookbook but don’t think for a moment that you don’t get much for your money – this book is loaded with great recipes and information. I own and love each one of these books and, if you can’t choose between them, I suggest you buy them all! But, if you can only choose one, which one is best? That really depends on what you want from a cookbook. 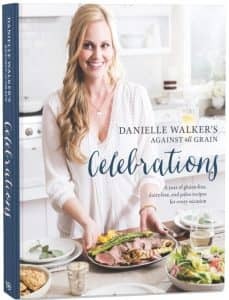 If you want lots of wonderful recipes for special occasions, Against All Grain Celebrations: A Year of Gluten-Free, Dairy-Free, and Paleo Recipes for Every Occasion (Available at Amazon.com)Is probably your best choice. The recipes are too grand for most typical days of the week, but if you want to push the boat out and create a fantastic celebratory meal, this is the book that will help you do it. It is, however, the most expensive of the three. 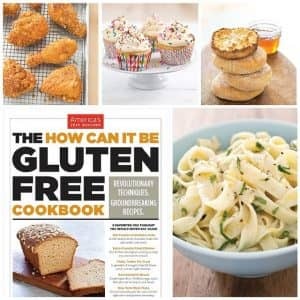 If you want a book that’s part cookbook and part textbook, look no further than The How Can It Be Gluten Free Cookbook (available at Amazon.com). I learned a lot from this book – not just about cooking but gluten in general. The recipes are more suited for everyday use and the middle-of-the-road price balances content with value for money nicely. 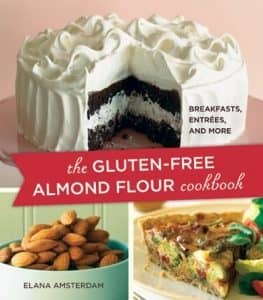 If you want a cheap, simple cookbook for everyday use that uses very few gluten alternatives, The Gluten-Free Almond Flour Cookbook (Available at Amazon.com) is for you. It’s plain and simple but none the worse for it. You’ll discover some great everyday alternatives to your favorite gluten-containing meals, and because of the emphasis on almond flour, there are no exotic ingredients to track down. The bottom line is that each of these books will make a great addition to your recipe book library and I have no hesitation in recommending to any of you.